NuSTAR FPMA lightcurves of IGR J17503-2636 in the 3–10 keV and 10–60 keV energy bands (upper panels) and the hard to soft ratio (HR, bottom panel). Credit: Ferrigno et al., 2019. European astronomers have investigated a recently discovered hard X-ray transient known as IGR J17503-2636 using space observatories. Results of this study, presented in a paper published March 7 on the arXiv pre-print server, suggest that this source may be a relatively faint supergiant fast X-ray transient. Supergiant fast X-ray transients (SFXTs) are a class of high-mass X-ray binaries (HMXBs) with supergiant companions. They showcase significant X-ray flaring activity, experiencing outbursts with very fast rise times and typical durations of a few hours that are associated with supergiant stars. Detected on August 11, 2018, by ESA's INTEGRAL space telescope, IGR J17503-2636 is a hard X-ray transient. The researchers later found that it hosts a heavily reddened OB giant star and was therefore classified as an HMXB. Almost immediately after its discovery, follow-up observations of IGR J17503-2636 commenced using NASA's Chandra, Swift and NuSTAR spacecraft as well as the NICER instrument on the International Space Station. A team of astronomers led by Carlo Ferrigno of University of Geneva, Switzerland, analyzed the results of this observational campaign and found evidence suggesting that this system is an SFXT. "In this paper, we report on all available X-ray data that were collected during the first reported X-ray emission episode from IGR J17503-2636 with the instruments onboard INTEGRAL, NuSTAR, Swift, and NICER, together with our interpretations," the astronomers wrote in the paper. Although IGR J17503-2636 faded very rapidly after it was identified by INTEGRAL, follow-up observations managed to detect faint X-ray emission from the source. 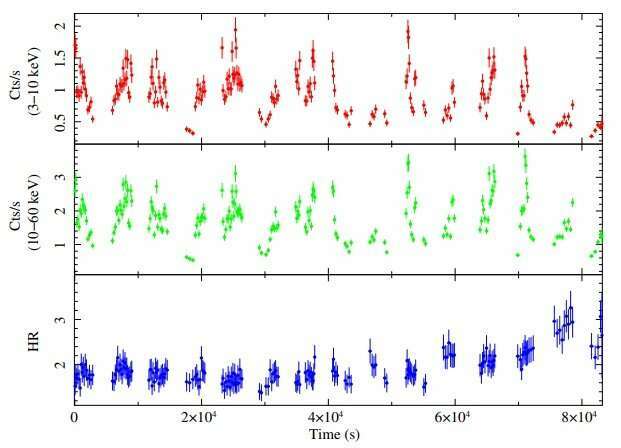 In particular, the emission from IGR J17503-2636 in the soft to hard X-ray domains (between 0.5 and 80 keV), exhibited a remarkable variability on timescales from a few seconds to a few thousands of seconds. According to the authors of the paper, this variability is typical for wind-fed HMXBs. This is due to the fact that fast wind of a massive companion star can shape a cocoon of dense material around the accreting star and variations of the wind can produce the observed X-ray variability on such timescales. In general, taking into account all the collected data during the follow-up campaign, the researchers concluded that the results favor the HMXB scenario for IGR J17503-2636. However, more studies are needed in order to confirm this assumption. They added that the available data also suggests that the system hosts a strongly magnetized neutron star. "Based on the fast variability in the X-ray domain, the spectral energy distribution in the 0.5–80 keV energy range and the reported association with a highly reddened OB supergiant at ~10 kpc, we conclude that IGR J17503-2636 is most likely a relatively faint new member of the supergiant fast X-ray transients. (…) We can conclude that the accreting object in IGR J17503-2636 is a NS [neutron star] endowed with a magnetic field of ~2×1012 G, compatible to other measured NS magnetic field strengths in HMXBs," the scientists explained.